This is not a cruise. This is a rule-rewriting, routine-breaking rendezvous for the whole family. Explore rainforests and conquer a volcano in St. Kitts. Brave the rapids to reach jungle pools on a tubing adventure in Grenada. 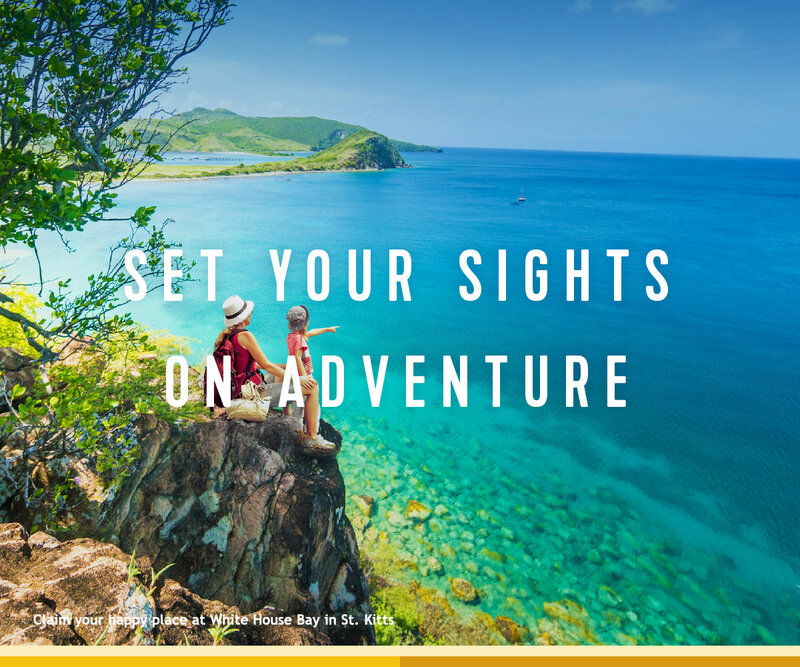 And uncover big savings to take you further — including up to 25% off your third and fourth guests and up to $100 to spend at sea in 2018. Come Seek the Royal Caribbean®. *Non-refundable deposit booking ("NRDB") cancelled prior to final payment due date will receive a future cruise credit in the amount of the deposit minus a $100 per person service fee ("FCC"). FCC is non-transferable and expires after 12-months from issue date. $100 per person service fee applies to changes to NRDB ship or sail date. Cruise must be booked between July 1, 2017 through July 31, 2017 the "Offer Period". Offer applies to sailings departing on or after August 1, 2017. Offer excludes China departures. Offer includes 50% off cruise fare of second guest who must be booked in the same stateroom as a first guest who books at full fare ("BOGO"). Offer also includes 25% cruise fare savings for 3rd guests and higher booked in the same stateroom as the first two qualifying guests. Non-Refundable Deposit reservations that are booked six months or more prior to the cruise departure date are eligible to receive a per stateroom onboard credit ("OBC") in the following amount: for sailings 5-nights and less, $25 OBC for interior and oceanview, and $50 OBC for balcony and suite; and for sailings of 6-nights and longer, $50 OBC for interior and oceanview, $100 OBC for balcony and suite. OBC is in USD, has no cash value, is non-transferable, not redeemable for cash, and will expire if not used by 10:00 PM on the last evening of the cruise. All other charges, including, but not limited to, taxes, fees and port expenses, are additional and apply to all guests. BOGO does not apply to third and higher occupancy guests. Offer is combinable with, promotional OBCs and instant savings, NextCruise offers, restricted discounts (for example, Seniors, Residents, Military), Crown and Anchor discounts and Shareholder Benefits. All offers are not combinable with any other offer or promotion, including, but not limited to, Standard Group, Interline, Travel Agent, Travel Agent Friends and Family, Weekly Sales Events, Net Rates. After the Offer Period, the Offer will be removed from the booking if the guest cancels and reinstates the booking or rebooks into a new booking on the same ship and sail date, applies a fare change, or changes the ship or sail date of the booking; certain other changes to the booking may also result in removal of the Offer. Offer applies to new, individual and named group bookings confirmed at prevailing rates. Individual reservations may be transferred into an existing group, assuming required criteria are met, though full deposit will be required at time of transfer. Failure to apply the required full deposit amount may result in the cancellation of the booking. Single occupancy guests paying 200% cruise fare are eligible for full amount of Offer; single occupancy guests paying less than 200% cruise fare are eligible for a prorated amount of the Offer. Offer available to residents of United States and Canada. Prices and Offer are subject to availability and change without notice, capacity controlled, and may be withdrawn at any time. Refer to www.royalcaribbean.com for complete terms and conditions. Royal Caribbean International reserves the right to correct any errors, inaccuracies or omissions and to change or update fares, fees and surcharges at any time without prior notice. Getaway with Barcelo Hotel Group and receive up to $1000 resort credit* at select all-inclusive resorts with Violet Clover Travel Group. Escape to a Barcelo Hotel Group resort and you’ll enjoy more than just a beautiful hotel and beach; you get water parks, kids clubs, adults-only pool areas, ala-carte dining and exclusive nightclubs. Plus, get up to a $1000 resort credit* and Insider Exclusives. From the colorful culture and cuisine of Mexico to the laid-back Caribbean island of the Dominican Republic, when you get away to a Barcelo Hotel Group resort, you get more than just a vacation; you get memories to last a lifetime. Fronting the dazzling waters of the Mexican Caribbean, the all-suite, 24-hour all-inclusive Barcelo Maya Palace provides an inspired setting for active travelers, spa enthusiasts and families seeking an unforgettable all-inclusive vacation. Great for families, active travelers and groups, 24-hour all-inclusive Barcelo Maya Colonial & Tropical caters to each and every visitor with an upscale blend of warm hospitality and dynamic amenities and services. Surrounded by a lush natural park of swaying palms and fragrant fauna, the 24-hour all-inclusive Barcelo Maya Beach & Caribe provides great values and a lively environment perfect for nature lovers, spa enthusiasts, active travelers and families. Offering a fun and active ambiance, a sports program, a wide variety of specialized restaurants and spacious guestrooms, this charming adults-only, 24-hour all-inclusive resort provides a personalized vacation experience for each and every guest. *The amount of $1,000.00 USD equals the discounts given to the Guest that can only be applied on the purchase of different services and products within the resort with the maximum already stated. **Offers and pricing subject to change without notice. Price advertised is for hotel-only for bookings 6/5-6/26 and travel 7/2/17-8/1/17 with specified room category. Prices quoted are per person based on double occupancy, are not retroactive, and are subject to limited availability. Government-imposed taxes and fees may apply. Travel protection is not included in advertised prices. Additional restrictions may apply. Various cancellation penalties, payment requirements and holiday/weekend/special event surcharges may apply. Please see the Funjet Vacations Bill of Rights for details.